I had a decent workout today even though I have a chest/head cold. My shoulders and knees were a bit achey. However, I still put in a solid effort to end the week. 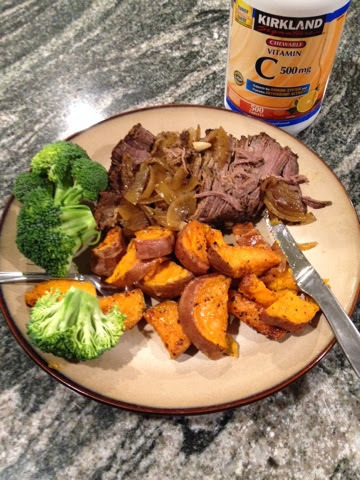 Now I will eat some awesome bee roast with broccoli and yams spiced with cayenne pepper. 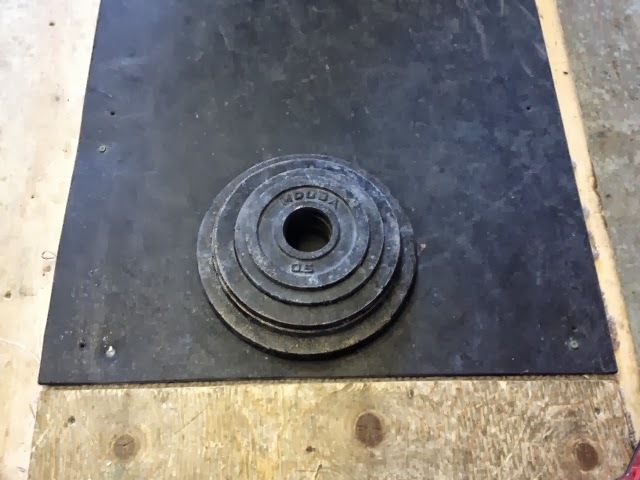 And some vitamin C.
Because of this I only use them for squats or pulls because I do not want to stress the collars and the bar unevenly as the other bumpers are not evenly dispersing the weight. 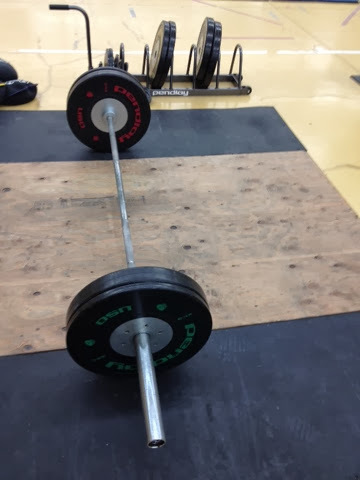 Some power cleans off blocks from the other day. 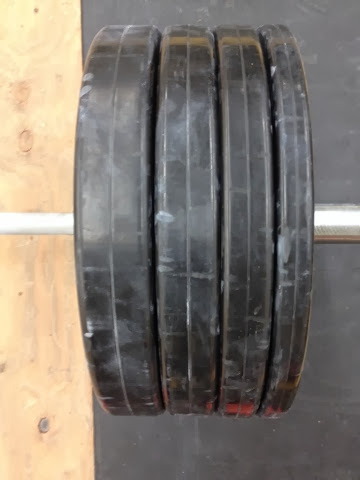 140kgx2, 145kgx2. The Kg change plates from DHS are Awesome. 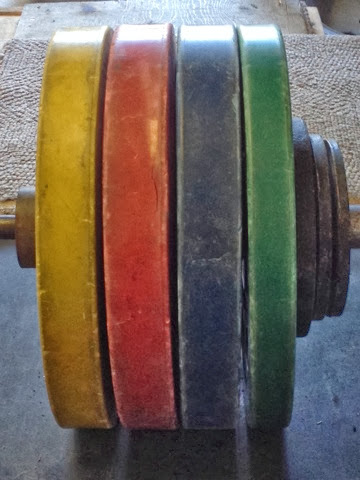 They do have a bit of friction on them so they hold the weights on the bar decently. They are rubber coated and coloured. 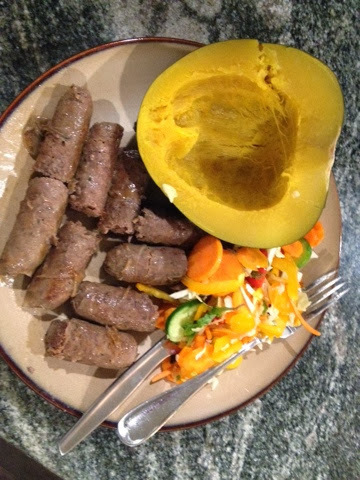 The set comes with 2-.5kg, 2-1kg, 2-1.5kg, 2-2kg, 2-2.5kg, 2-5kg plates. 1 have used them for over a year without any issues. 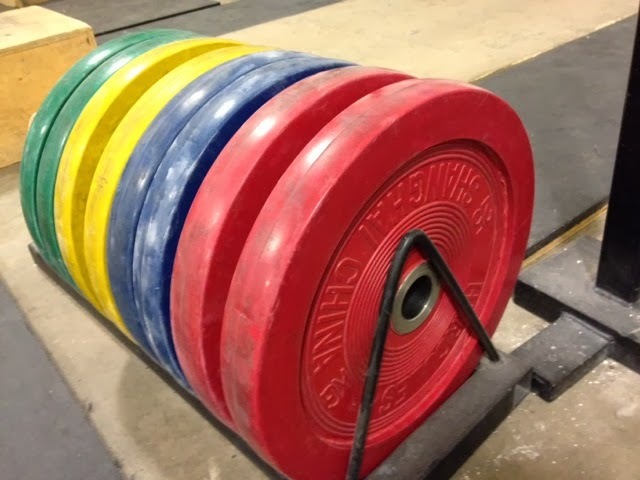 I personally do not like these bumper plates. The bounce erratically from side to side when dropped. The red 25kg plate had a big circular crack around the edge. This crack developed only after a few months of lifting. You can see the crack in the picture below. 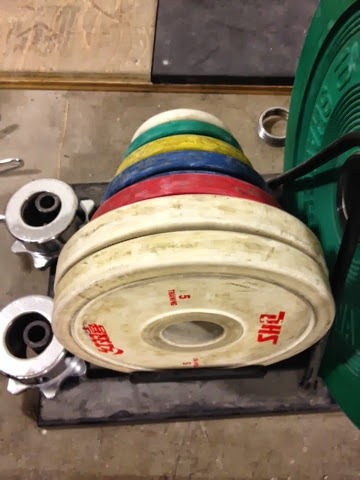 The positive remarks I will give these plates is that they are all uniform thickness and the 10kg green plates are very durable. Usually 10's are the weekest of the bunch. 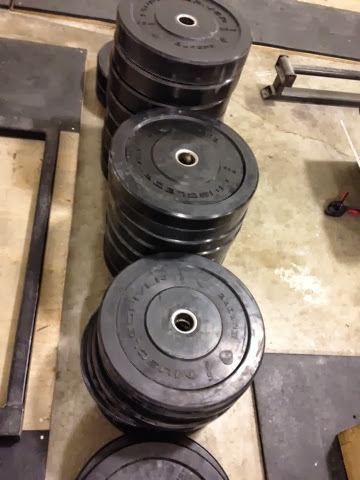 I bought a 140kg set of Pendlay Elite Coloured bumper plates from the Muscle Driver USA website in 2009. When they arrived I was disappointed that there was a split in the red 25kg plate and some bulges in the bumpers. I emailed Glenn and and he assured me that if any substantial damage happened, he would replace under warranty. That was good enough for me. This picture is in late 2013. I use these bumpers regularly. You can tell they are used but there is only superficial wear and tear. These bumpers still perform awesome. I like the way they drop. Very consistent and with a nice thud. They are not erratic like Mavrik or Hercules bumpers, now made by DHS. They have proven themselves tough and reliable over time. Even though there is some superficial splits around the collar steel inserts, they still are tight with no play. Now Pendlay has redesigned their bumper plates. 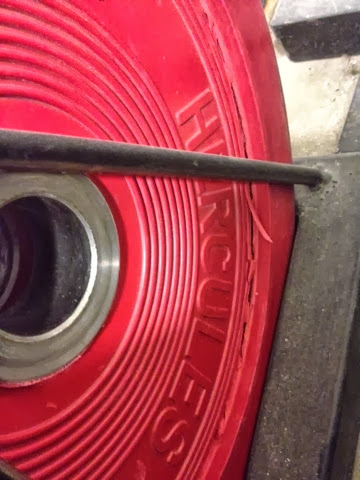 I have been using a DHS needle bearing Olympic bar (training bar) weekly, for the last year. I will start off with some quick ratings: Spin=great, knurling=good, whip=great, durability=great, price=great. The knurling would have scored an excellent if the center knurl didn't chew up my neck so much on cleans and front squats. But the bar does have a nice knurling for grip without being to aggressive like some of the newer Eleiko training bars I have tried. No complaints on the spin, just keep it oiled regularly and they will be fine. It does spin better than bushing bars, no question. I also use a Pendlay bushing bar and it is decent but does not spin as nice as this needle bearing bar. The collars are solid and work really well doubling as 2.5kg weights. 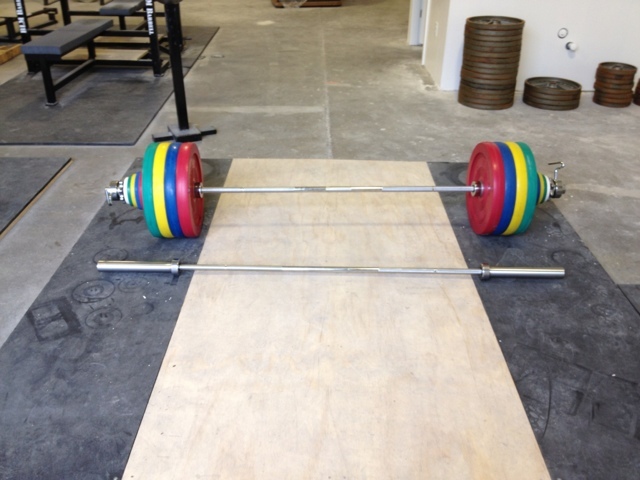 Pictured below is the 190kg DHS training set with men's and women's bar. We have had a couple issues. Initially one of the DHS bar's needle bearings were damaged. Then after a year of use, one of the other DHS bars has a slight bend in it. Crushed some good numbers today then crushed a good meal!